These spoons appear to be ceremonial in nature. Unfortunately, I do not know much about them either as to source or use. If any readers have any further ideas, please send me an email from the main page. This very unusual looking spoon is a handmade one-of-a-kind and was probably for some type of religious ceremony. The only mark is "sterling silver". It measures about 8.125" (210mm). If any surfers have further information about this spoon please email me. This very large (8.375" --215mm), heavy and unusual cast spoon (one picture above and two below) has a French mark which was used between 13 January 1864 to June 1893. However, I believe that this is a representation of Queen Victoria. The Art Nuevo lady is earlier in the movement and not as sinuous as later versions, a lot of other symbols are also cast into the spoon including a crown at the top, a female boat masthead to the left of her head, and lions to the right of her head. Just above the bowl junction, is a figure which looks like a "begging lion" and the reverse shows his tail. 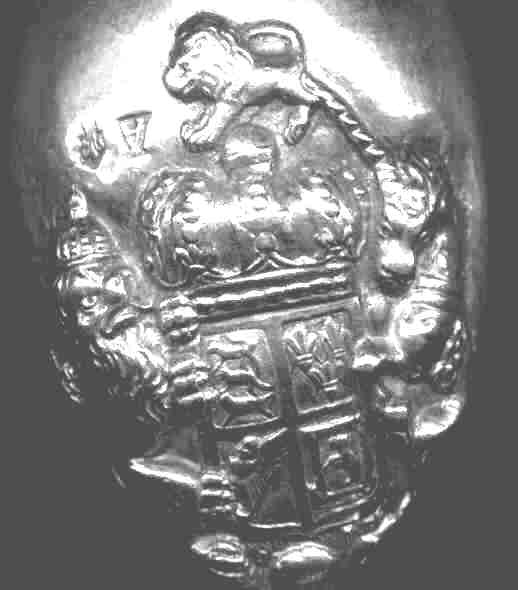 The back of the bowl showing the Royal arms (below) and includes a crowned lion (left), unicorn (right--difficult to see but the corkscrew horn is obvious), and a maned lion above the crown. This is probably not a souvenir spoon. This spoon was moved from the Art Nuevo exhibit after I learned that Dorothy Rainwater had classified a very similar piece as "ceremonial". But she did not clarify her thoughts on this matter. I have been told that bronze (copper, pewter, gun metal) spoons of this type are used in "holy water" and "lamp oil lighting" ceremonies in Nepal and Tibet. Apparently spoons of this nature have been used by the Hindu's for centuries. The oil lamp is called a sukunda and the spoon is called a sumicha. Apparently lighting the sukunda is an important social and religious obligation. The figure at the top is called a ganesh or ganesha and is an important symbol for a good future. Some folks believe that they can date these spoons, but I sincerely question that assumption. It is virtually impossible to date utensils of this type using scientific analysis of the metal and since the styles have remained virtually the same, a style analysis is not possible. Also it is not unusual for the oriental countries to make reproductions of "old holy objects" and sometimes they even use old metal. I have met a few dealers who sell these pieces and one even offer written proof of their age. The only thing I can suggest is Caveat Emptor. If you have any more info please email me. I suspect that this very interesting looking spoon is a replica of a ceremonial spoon. It is cast from a bronze type metal, but it does not show much hand workmanship. The spoon represents Siva and Parvati with their son, Kartikeya, in the bowl. These figures are very basic to Hindu art, religion and culture. Each of the figures has symbolic meaning, but if you are really interested in this you will have to do your own research. A very heavy cast spoon which was probably for use in lamp oil lighting. I suspect that the metal is pewter or some other "white metal"